Every since mineral make up has hit the market, they have been a rage just like the BB creams. Mineral compact, mineral foundation, mineral eye shadows etc. 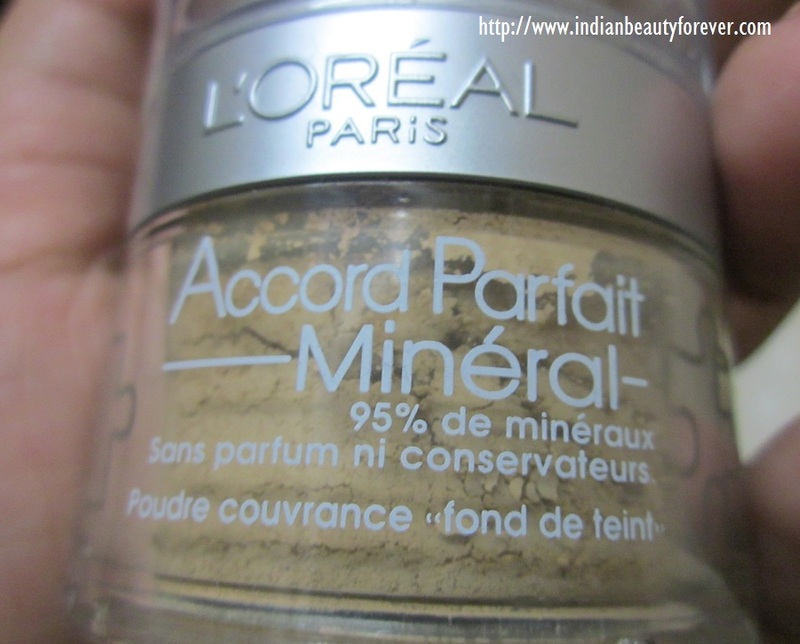 I have this L’Oreal True Match mineral foundation for around more than 6 months and have used lot of times but always forget to review it. This is my first mineral foundation or you can say first mineral make up. Before starting the review, a brief intro about what actually mineral make up means. Mineral makeup is made up from the substances that are mined from the earth’s crust. They normally contain Mica, Bismuthoxychloride, titanium dioxide which is also found in the sunscreens, iron oxide and zinc oxide (and some others). These Mineral makeup are said to have negligible or no preservatives, fragrances or dyes that are more susceptible to cause skin allergies. They do not clog pores and also safe for the acne prone skin and for those with sensitive skin. Mineral makeup is like more natural and hypo allergic. A makeup product can be called as a mineral makeup even if it has only 5% mineral content. So, If you are trying to get a good mineral makeup then try to check the ingredients and the amount of mineral content present in the actual product. As compared to the normal make up they are usually expensive. True Match provides SPF 15 to help protect your skin against the premature ageing effects of the sun. Tested under dermatological control, suitable for all skin types. No perfume, No preservatives. The formula is fragrance-free and oil-free. It is also non-comedogenic, meaning that it won't clog your pores. 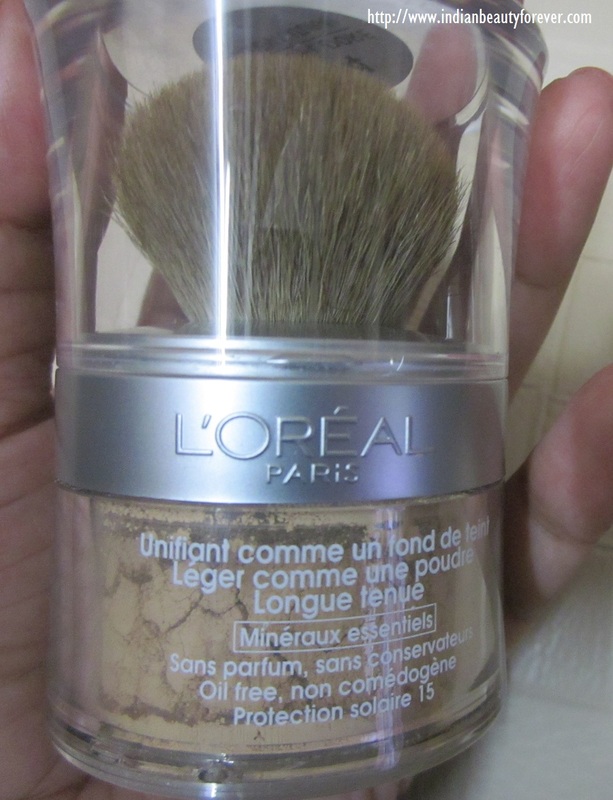 My Experience: This Loreal True match Mineral foundation comes in a very sturdy packaging. It has a transparent cap which is very sturdy and not prone to crack easily. The bottom container is also sturdy and contains the mineral foundation, it is covered with a lid that has small holes to take out the product. Over that container, there is a screw cap with a kabuki sought of small brush attached, with which you can apply the product. 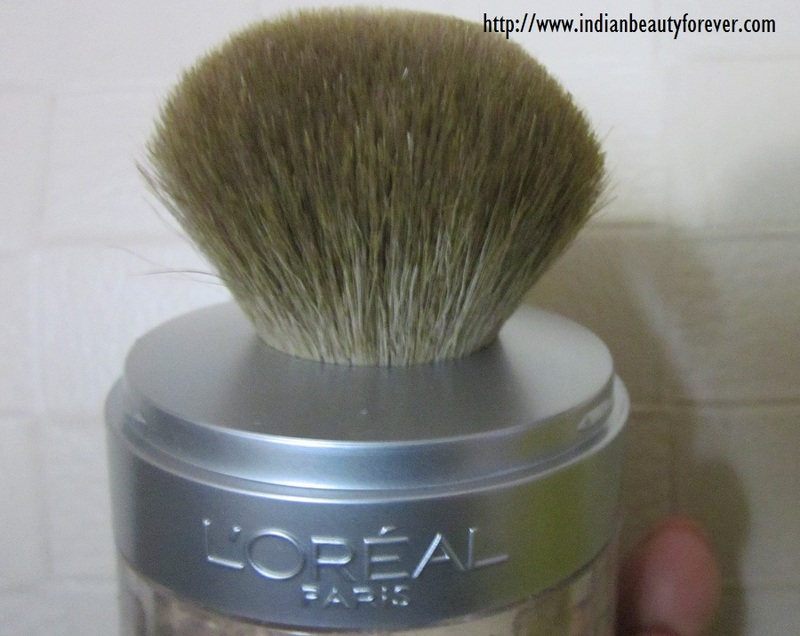 Brush: This brush is very dense with natural bristles that are a little rough. So far, I have not seen even a single strand came out. It is easily washable. Once I wash it I put it upside down so as to let it dry and not to loosen the glue inside else, the strands can fall out. 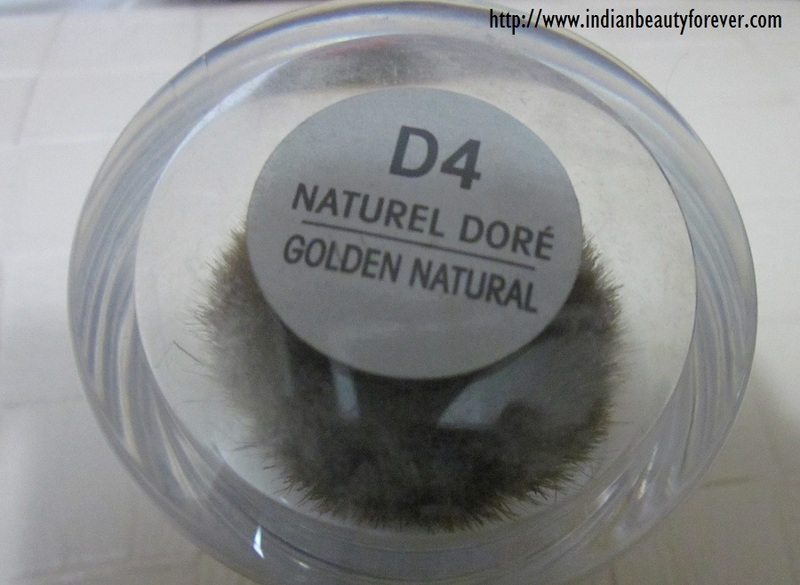 Product: This shade is D4 Golden natural which can be perfect for fair skin tones. It does fill out fine lines and gives sheer to medium coverage. I also noticed that the coverage is not as buildable as more product you apply the more looks cakey and dry it looks. I like to take a little bit on the lid and then using the brush that came with it. Just touch the brush on the forehead, nose, cheeks and chin. Then with the help of the brush, I blend it properly. I felt that blending it evenly can be tricky especially around the nose and corners of the mouth. If I have to use a concealer, I use underneath it so as to camouflage the marks and blemishes better. 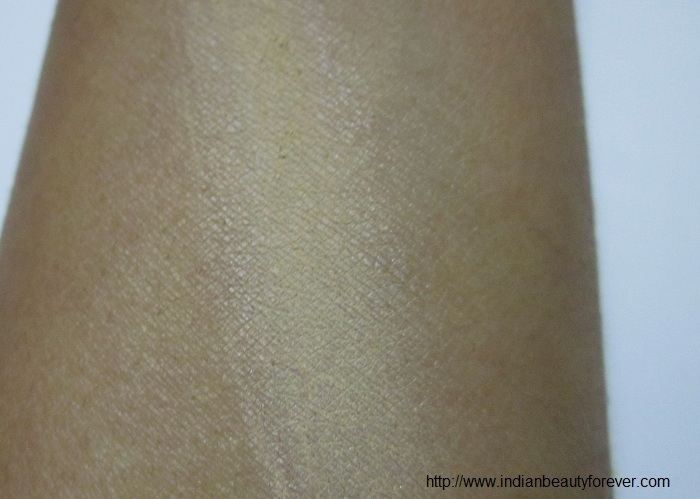 If not blended properly it can look blotchy. Since I do not like or require much coverage, I just sweep a little bit on the entire face and that is like more than enough for me. When I apply it more for medium coverage then I feel little heavy on my skin. I also realized that once I apply it within 10 -15 minutes it adapts itself to match my skin tone and also does gives some sheen. You may feel a little dry with this if you have dry skin so try to moisturize before using this that can also promote the blending procedure. But I doubt how it will fare with the dry skin. It is sweat proof and water proof to noticeable extent which is good for those who sweat or live in areas where they are more likely to sweat or in summers. Finding the right shade of the foundation is always like a battle which is no different with this as well, you have to make sure that the color matches your skin tone closely at least if not perfectly. For me it’s more like a compact than the foundation. Below are the pictures with and without. You can see that it has not provided any significant coverage but sheen. I have seen Revlon and Faces Canada also have the mineral loose foundation. I am eying on the faces one once it gets over which I think will take ages or it will get expire before I could even finish it. It also does make skin a little satiny. No preservatives and artificial fragrances. Waterproof and sweat proof to certain extent. Blending can be tricky, not easily bendable evenly. Bristles could have been a little softer. Sheer coverage is fine but hard to get the medium to heavy coverage. My take- It is a decent product that will not clog the pores and staying power is quite good. Coverage can be built as needed. Do try it if you don't mind the price and want to really use a mineral makeup. Happy new year Niesha!! ♥ all the pics!! Thanks for sharing hun. Great review. Indeed, it is messy and blotchy.. and way too expensive. Yeah thats right its not that great! It makes the face dry and cakey looking most of the times. even if you will apply less it feels as if you have put tones of it. Thank you Neha.. no its not all. i am better with my liquids. Thanks for the useful review Niesha! Great to see its pros but distressed with your ratings n cons. Keep reviewing. Niesha ! this post was so helpful, Thank you. I was about to buy this product but was in 2 mind cause its a bit on the expensive side. Its not worth the price. I haven't tried it. Thank you for the review!